Seaglass Barn (Sand) at Seaglass Barns in East Ruston, near Stalham, Norfolk sleeps 6 people. 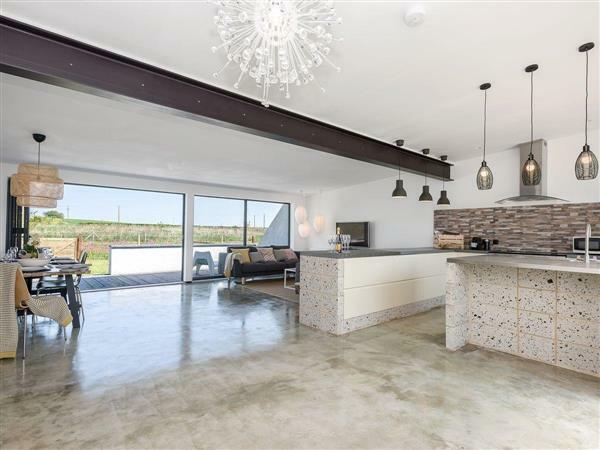 These stunningly presented, single-storey barn conversions (refs UKC1329 [Seaglass Barn (Sea)], UKC1330 and UKC522 [Seaglass Barn]) have a contemporary style that offers great accommodation for families or friends holidaying together. The properties are located in open countryside just over 4 miles away from the coastal village of Happisburgh with its iconic red and white striped lighthouse. Guests can enjoy the 1¼-acre grounds with a wildflower meadow and willow wigwams; explore the sandy unspoilt beaches of the Norfolk coast; marvel at the hundreds of seal pups at Horsey Gap Beach in the winter months; or visit the seaside town of Cromer, with its pier, and enjoy a day on the beach. There is a beach hut available for the use of guests at Seaglass Barns, which includes body boards, wetsuits, tea and coffee making facilities, beach towels and children’s play equipment. Once you have explored the coast, venture to the Broads which are only a short drive away. Wroxham, known as the ‘Capital of the Broads’, lets visitors hire a day cruiser to see all the pretty Broads’ villages. For children, a day out to BeWILDerwood at Horning is a must; this outdoor adventure park has zip wires, jungle bridges and lots more. Weavers Way is just a short walk from the barns and is ideal for birdwatching or walking. There is a fishing lake just 1 mile away, and day fishing tickets can be purchased at the lake. Gardeners will enjoy a visit to East Ruston Old Vicarage Gardens with its acres of delightful and interesting gardens. There are National Trust properties in the region which are well a worth visit. Alternatively spend a day in the fine city of Norwich with its theatres, cathedrals, museums, outdoor market, cobbled streets and enjoy a fine array of shops and cafés. Walking, cycling, birdwatching, fishing and sailing are all available locally. The beach is 5 miles. With the shop, pub and restaurant 2 miles from Seaglass Barns near Stalham. Seaglass Barn (Sand) is all on the ground floor. Open plan living space: With polished concrete floor. Living area: With 50 Freeview Smart TV, CD player and patio doors leading to garden. Kitchen area: With electric range, microwave, fridge/freezer, dishwasher and washer/dryer. Bedroom 1: With king-size bed and en-suite with shower over bath, and toilet. Bedroom 2: With king-size bed. Enclosed lawned garden with sitting-out area and garden furniture. Hot tub for 4-5 (private). Private parking for 2 cars. All properties: Electric central heating, electricity, bed linen, towels and Wi-Fi included. Welcome pack with cocktail. Beach hut. External warm water dog shower. 1¼ acres of natural grounds with willow wigwams (shared). No smoking. Please note: Holidays at Seaglass Barn (Sand), Seaglass Barns run from Friday to Friday. Pets allowed at Seaglass Barns - Seaglass Barn (Sand). For a better idea of where Seaglass Barns - Seaglass Barn (Sand) is, you can see Seaglass Barns - Seaglass Barn (Sand) on the map below. Seaglass Barns - Seaglass Barn (Sand) is in Norfolk; should you be on the lookout for a special offer, you can find all the special offers in Norfolk. It's always worth checking to see what is on offer at the moment. Do you want to holiday near Seaglass Barns - Seaglass Barn (Sand) (UKC1330), you can see other cottages within 25 miles of Seaglass Barns - Seaglass Barn (Sand); have a look to find your perfect holiday location.